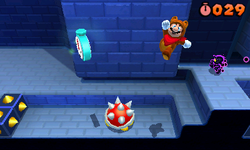 Special 8 is the eighth and final special world that appears in the 3DS game, Super Mario 3D Land. It features seven levels and a Toad House. Except Special 8- , all levels in Special 8 must be unlocked by collecting a certain amount of Star Medals, with the amount growing by ten with each level. Instead of a remix of World 8's music, Special 8 instead rearranges the Mario Drawing Song. When Special 8- Crown is unlocked, that music is remixed, featuring more bass. Special 8, unlike all other special worlds, does not imitate World 8 to any extent, and as such, is the only truly original special world. 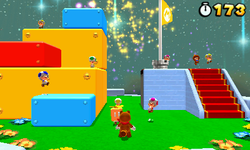 It takes place in a light yellow meadow that highly resembles World 1 from Super Mario Bros. 3, with large blocks, the same ground texture, and small hills highly resembling the ones found in Super Mario Bros. 3. 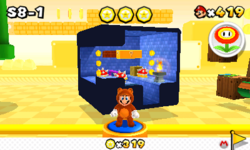 It takes place in a light yellow plain with Blocks, Coins and Warp Pipes in the background. 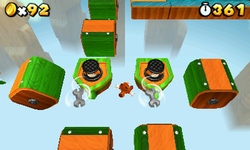 What sets this apart from the other Special Worlds is that while the others have all the levels available to begin with, the player must clear each level to access the next one (not unlike the progression of the regular worlds). 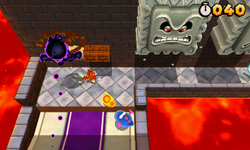 Special 8-1 A harder version of World 1-2 with the time set to 30 seconds and a Cosmic Clone; the player also starts near the exit and goes backwards. Requires 230 Star Medals to be unlocked. Special 8-2 A harder version of World 8-3 with faster spinning platforms; this is the only level in the world without a 30-second time setting or Cosmic Clones. Requires 240 Star Medals to be unlocked. Special 8-3 A harder version of World 5- and Special 5- with the time set to 30 seconds and a massive Cosmic Clone. Requires 250 Star Medals to be unlocked. Special 8-4 A harder version of World 8-6 with the time set to 30 seconds. Requires 260 Star Medals to be unlocked. Special 8-5 A harder version of World 7- with a massive Cosmic Clone. There is no boss. Requires 270 Star Medals to be unlocked. Special 8- A harder version of World 8- with the time set to 30 seconds. Defeating Hammer Bros. awards the player with an additional 10 seconds. Requires 290 Star Medals to be unlocked. 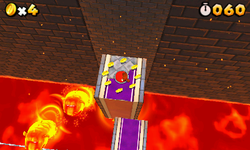 Special 8- The true final stage, and the hardest level in the game. 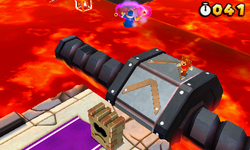 When unlocked, this stage replaces the pipe going between Special 8 and World 8; as a result, the pipe in World 8 disappears. To unlock this course, the player must have five stars on their profile. 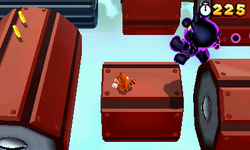 The stage is also the only stage in Super Mario 3D Land that has no Star Medals. It also has no checkpoints. This page was last edited on March 23, 2019, at 09:43.